This May 23, 2018, file photo shows Facebook's CEO Mark Zuckerberg, arrive to meet France's President Emmanuel Macron after the "Tech for Good" Summit at the Elysee Palace in Paris. The New York Times reports that Facebook has acknowledged it shared user data with several Chinese handset manufacturers, including Huawei, a company flagged by U.S. intelligence officials as a national security threat. The Times says Facebook acknowledged the handset makers — Huawei, Lenovo, Oppo and TCL — were among 60 it had shared data with as early as 2007. Facebook told the newspaper it planned to wind down the Huawei deal this week. The data included work and education history, relationship status and likes on device users and their friends. The report didn't say the data was misused. Facebook is launching a dating feature. 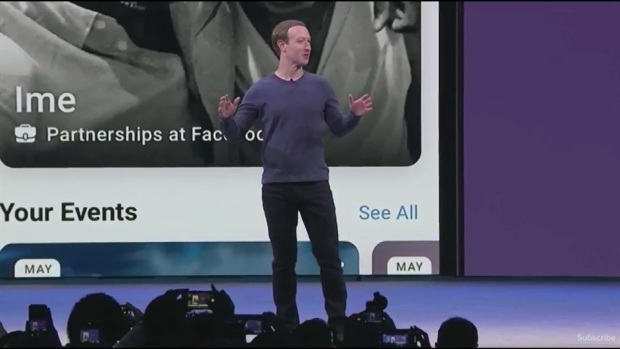 CEO Mark Zuckerberg said to laughs at Facebook's f8 developer conference Tuesday that the new tool is "not just for hookups" but to build "meaningful, long-term relationships." Facebook did not immediately reply to a request for comment. U.S. Sen. Mark Warner, a Virginia Democrat, says he wants to know how Facebook ensured data was not transferred to Chinese servers.